Cars parked along the tree lined street. Image is complimentary to image number 005593. 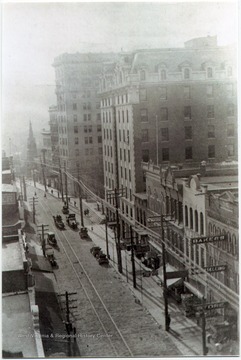 Cars and telephone and electric wires line the street. Image is complimentary to image number 005592. 3. 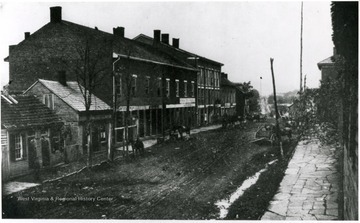 Main Street, Clarksburg, W. Va.
Main Street, Clarksburg, W. Va.
View of unpaved streets, stone sidewalks, and old buildings that lined Main Street in Clarksburg in 1863. 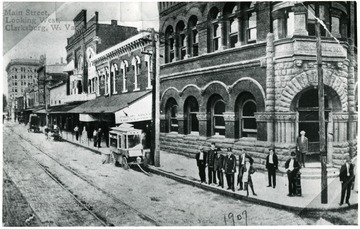 Townspeople are standing in front of buildings located on Main Street, looking west, in Clarksburg, West Virginia. 5. Main Street, East From Fifth Street, Clarksburg, W. Va.
Main Street, East From Fifth Street, Clarksburg, W. Va. 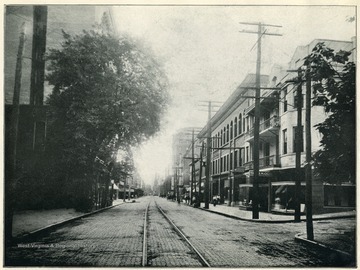 Image from 'Industrial and Picturesque Clarksburg, W. Va.' published by the Press of the Clarksburg Telegram Company, Printers and Publishers, Clarksburg, W. Va., 1911. 6. 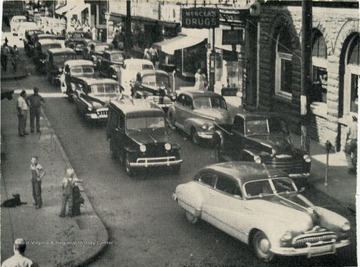 Traffic in front of Mercer's Drug Store on West Main Street, U. S. Route 50, in Clarksburg, W. Va.
Traffic in front of Mercer's Drug Store on West Main Street, U. S. Route 50, in Clarksburg, W. Va.
7. 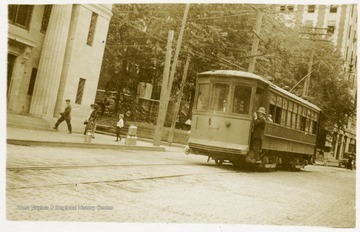 Street Car on Main Street, Clarksburg, W. Va.
Street Car on Main Street, Clarksburg, W. Va.
8. 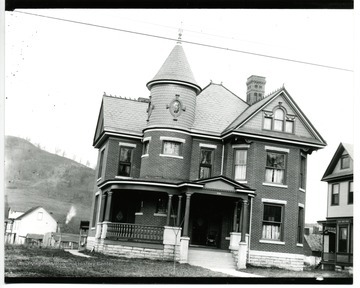 Home on East Main Street, Clarksburg, W. Va.
Home on East Main Street, Clarksburg, W. Va.
9. 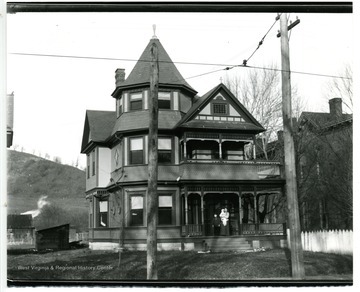 Home on East Main Street, Clarksburg, W. Va. This house on East Main Street stands on a site now occupied with McGlumphy Funeral Home. 10. West Main Street Looking East, Clarksburg, W. Va.
West Main Street Looking East, Clarksburg, W. Va. 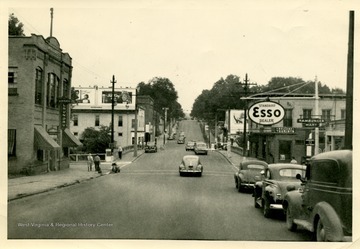 The view shown is West Main Street of Clarksburg looking towards Quality Hill; the bridge crosses Elk Creek. 11. 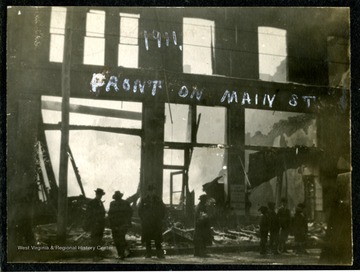 Fire Damaged Building, Main Street, Clarksburg, W. Va.
Fire Damaged Building, Main Street, Clarksburg, W. Va.
A view of Front on Main Street after the fire of 1911, Clarksburg, W. Va.
12. 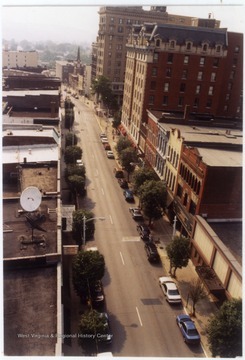 Looking Down on Main Street, Clarksburg, W. Va. 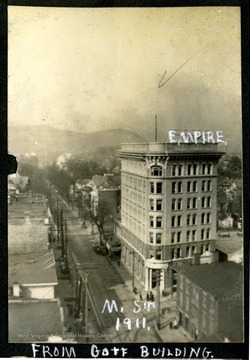 Looking Down on Main Street, Clarksburg, W. Va.
A view of Main Street, Clarksburg from Goff Building; Empire Bank building is on the right.